I have always wondered why Orange is orange, coincidentally or just lazy to find words to describe the colour of an orange, orange. Then why isn’t Lemon, called yellow ? 😀 Haha sorry, just being a pain. Orange has been quite a permanent fruit in the kitchen. Most of my cakes for cake orders uses orange, zest and juice. And it’s great to make it into juice during a HOT HOT day. Plus, you can even use it for cooking. 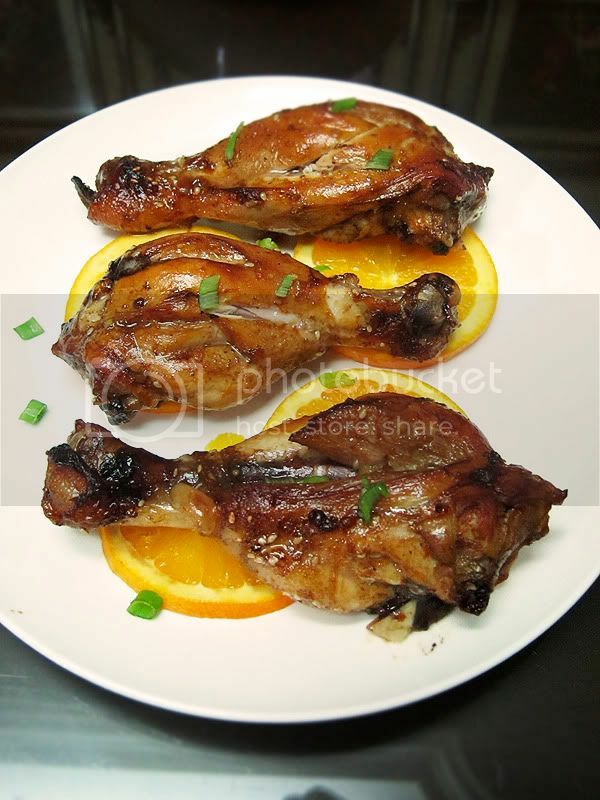 When I make BBQ at home, I’d sometimes barbecue the chicken wing on a slice of orange just for the extra tangyness. If only I can grow oranges …. Well actually, can I ?? Currently, everything I cook with, I’d think, can I plant this ? so I don’t have to go out and buy? I’d just use it as and when I need it. Fresh from the tree!! How awesome is that. I just saw a post on planting avocado and I read somewhere that if you plant your own avocado from the seed, the fruit is not edible and it takes a long long time for it to bear fruits. But if it’s a baby tree and you plant it from the stem, the tree fruits faster and it’s edible. Is it true ? I’m seriously thinking about growing my own avocado. I cannot stand an avocado being sold at RM4.99 each. :E Or how about lemons, can I grow lemons too?? OH and I’ve just planted some mint, hope it grows well..
Anyways, let’s come back to the Orange. I came across this recipe from Seasaltwithfood some pretty long time ago. 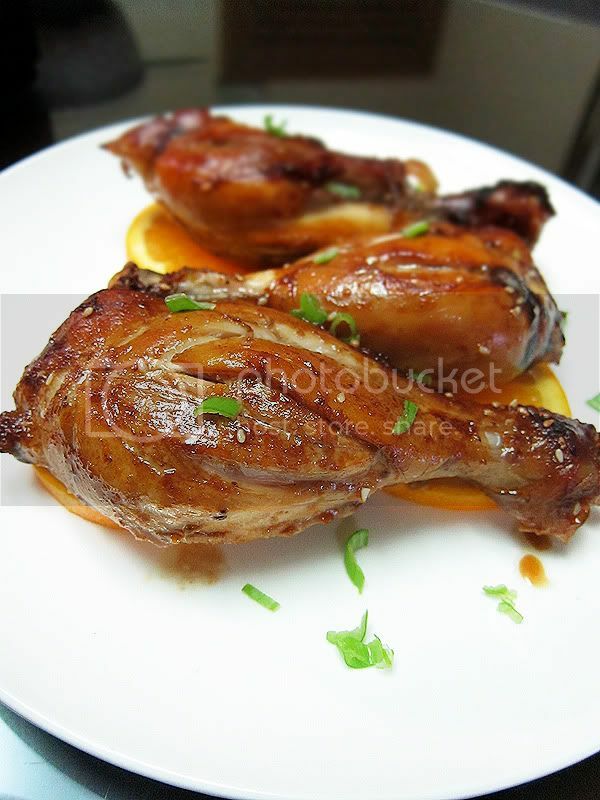 The orange chicken is easy to make and deliciously appetizing. 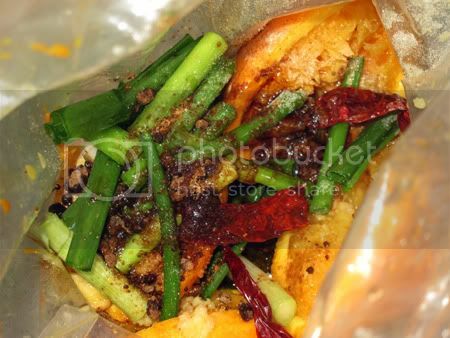 *This is the marinade, I usually put them in ziplock bags and add in the chicken and shake them so the it coats better. Rinse the chicken pieces and pat dry.?? In a medium bowl, whisk together the orange juice, orange zest, ginger, garlic, scallions, chili flakes, sugar, soy sauce, dark soy sauce, rose wine, vinegar, sesame oil, and peanut oil. Mix well. Set aside half of the mixture, and pour the remainder over the chicken.?? Place the chicken in the refrigerator and marinate for 4 to 5 hours, turning pieces every hour.?? Remove the chicken from the marinade, place in a roasting pan, and roast, turning to brown on all sides. Spoon the reserved marinate mixture over the chicken as it roasts. Test for doneness by piercing with a knife; chicken will be done when juices run clear and the meat is tender, about 45 minutes. 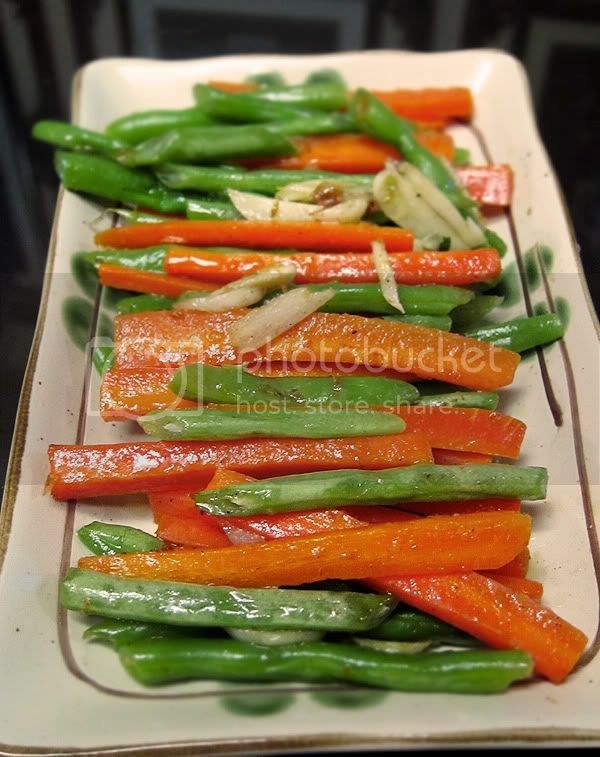 For a side, I made Blanched green beans and carrots with lemon and garlic. Bring a large pot of salted water to a rolling boil. Add the beans and carrot and cook until al dente about 4 minutes depending on the size. Drain and submerge in ice water to shock. Drain. When ready to serve heat a large sauté pan with butter until bubbling, add the garlic and lemon and sauté quickly about 30 seconds. Add the beans and carrots and cook until just warm. Season with salt and black pepper. Serve warm. I also made a broccoli and cauliflower gratin to go with it. Click for recipe :).